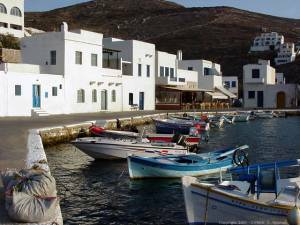 Just four kilometers beyond the village of Pyrgos and on the north shore of the island, the small fishing port of Panormos is a major attraction for visitors looking for a charming seaside location with plenty of tavernas and fish restaurants. One of the most picturesque spots, all of the restaurants overlook the harbor, full of colorful bobbing caiques. There are two beaches nearby, one to the left across the headland and accessible on foot, and the other to the right along a paved road for auto traffic. Historically, the port was used for commercial export of raw marble and for the village baskets made in Volax.